The updated plaid in the David Reversible Coverlet Set gives a modern approach to this simple classic. The bold black plaid is highlighted by a white background and pops of red while a solid black covers the reverse. One decorative pillow uses twill tape in a criss cross fashion to complete this look. I was looking for a masculine bed cover with grays whites and blacks and thats exactly what I got. The splash of red adds just the right amount of color. I use an electric blanket so I wasn't looking for warmth just a nice cover. Perfect weight not bulky like some comforters. I would recommend this as a very nice coverlet like it says.....not a comforter. The shams and pillow were a nice bonus!! 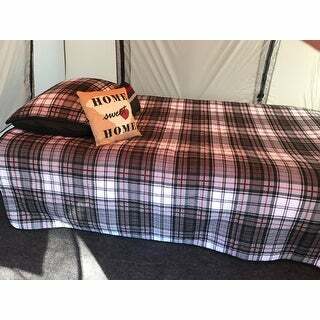 Mi Zone quilts are very high quality as compared to the cost. This is the third set that I have purchased. This one is high quality as well. The colors are true to the photo and it has quality quilting. We liked this set so much that when our son went from a twin to a queen size bed we purchased the exact same set in the new size. This coverlet set is so soft and light weight. It's a perfect alternative to comforters during the summer months in warmer climates like TX. Very gender neutral. The colors make it easy to find coordinating pieces. Very nice quilt for a boys room. I ordered twin size. It is holdimg up very nicely. Great quality and great price and the colors look fantastic! this set is a classic and my daughter loves it. My only complaint is that Mizone, doesn't have more styles and patterns to choose from. I love this set and love the price, you won't be sorry. Soft, light, cozy, very comfortable, most other quilts I've had have been so stiff. This feels more like the perfect bed blanket. Love it. This is a cute 3 piece set which was great for a camping trip. Very comfy and it fit the twin air mattress perfectly. Bought this set for my son. He loves the weight. The colors are perfect! Perfect quilt for my son's dorm room. Super soft after I washed it. Love it! Very nice quilt set for a teenage boy's room. The fabric seems to hold up well and is made from quality material. The colors are vibrant and makes the room nice with a warm feeling. I purchased this for my 20 year old son and he really likes it. It's very soft and looks nice. The quality is very good. Pleased! "i bought this new and washed as directed...it has multiple stain spots (bleeding over) on 1/4 of comforter. Tried using spray n wash and still no luck. I don't understand why it would bleed over during a cold water wash? I can't locate my receipt, not sure what else to do?" You will be contacted by customer care regarding your coverlet set. "Will this actually fit a dorm room twin xl bed or is it meant for a true twin size bed? I'm worried that it's going to be too short for my son's dorm room bed." This should fit an XL twin.